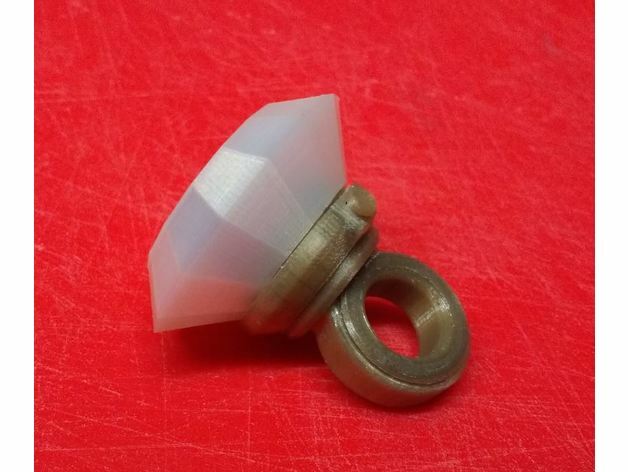 Cosplay light up ring #3DPrinting #3DThursday « Adafruit Industries – Makers, hackers, artists, designers and engineers! Bogus shared this project on Thingiverse! There is space inside the hollow gem to take two led’s in series I chose to salvage a couple of white ones from a cheap torch/flashlight. All of the parts should fit together as shown in the pictures. The part labelled switch stopper is optional and simply prevents the switch pushing back inside the ring body when the button is pressed. The battery contacts are simply made from the legs of a capacitor quite thick, 0.8mm 0.03in and should be bent to fit, with a slight hump where the contact with the battery is made, I think the pictures show this. The wires can be super glued in place as should the non contact parts of the battery contacts. I found the best orientation for the batteries was positive down and is wired accordingly. Ignore the orientation of the batteries in the picture with the ring showing IKEA on the top, they should be IKEA side down. I used a switch salvaged from an old monitor control panel, you may have to find something similar, The printed power button simply glues onto the switch when it is place. The printed layer immediately above the switch may not print at all, it’s very thin, but is not important.